Himesh Reshammiya who recently launched the title track of his second album ‘Aap Se Mausiiquii’ has been getting great response, so much so that even Salman Khan could not resist singing a few lines. Recently, Himesh Reshammiya visited the Bigg Boss house to promote the new album. 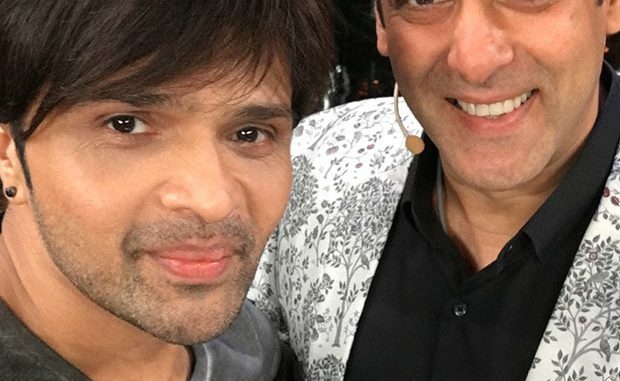 During the interaction about the song Salman Khan and Himesh Reshammiya started a candid jamming session singing some of their best songs together including Jumme Ki Raat , Photocopy , Tere Naam , Just Chill and Teri Meri. But what really excited Himesh and the audience was when Salman started singing a few lines of ‘Aap Se Mausiiquii’. The title track has crossed 5 million hits already in few days and the remixes of the title track by the top DJs of country are rocking every night club in town. The second track ‘Menu Kehn De’ has got 2 million views already and the entire album will be launched soon at a grand event in Mumbai. Produced by T-Series, the album ‘Aap Se Mausiiquii’ has been sung and composed by Himesh Reshammiya.